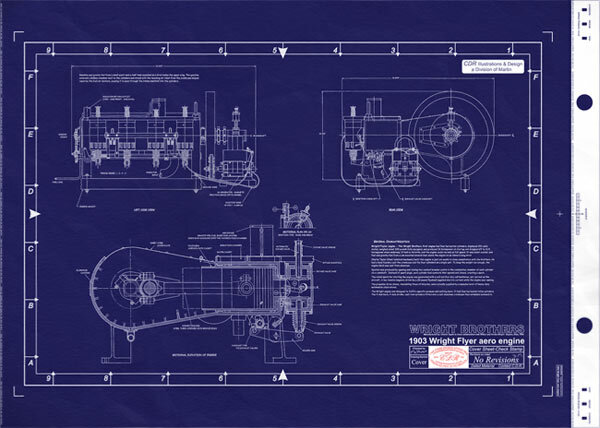 Developed on a full size master sheet -- measuring 42"x 30"
For many… the term blueprint is used loosely to describe copies of original drawings or tracings. Formed by light-sensitive iron salts, the blueprint process is characterized by white lines on a distinctive blue background that can range from deep to moderate in intensity. 2. The azo dye (also known as coupler): a colorless chemical that combines with the diazonium to produce color. In a variety of combinations and strengths, these two chemicals are mixed together in water and coated onto paper. The resulting coating is then dried, yielding our specially treated paper. This paper is now sensitized and ready to develope; thus it is stored in our dark, temperature controlled room until you place your order. The paper (now film) must be stored properly and developed within 90 days, after this time the sensitized stock must be discarded. The process starts with a master: original documents that have been created on a translucent medium. Such media include vellums and translucent linens. This master is placed over the chemically modified paper and exposed to a special frequency of high-intensity light. This is a timed process; If exposed for to long the blueprint will show blooming and loss of detail. If exposed for to short of duration the blueprint will not have contrast and be dificult to read. This is a one-to-one process, no enlarger is used. Light destroys the diazonium salt. Ammonia gas or Ammonium soda/water vapor solution is used as a developer after exposure; it completely neutralizes the acid and allows the remaining diazonium salt to combine with the reactant to create a blue dye. The nearly completed Blueprint is then heated to stabilize the compounds and to remove any residual chemicals. This yeilds acid free paper, archival quality blueprints. The result is a blue sheet of paper with white lines, called a blueprint. Aside from direct contact with water, or extended exposure to fluorescent lights (UV) direct sunlight; blueprints are as stable as the paper on which they are created. Blueprints can last centuries with proper care and handling. Prussian Blue, the now pigment that gives the Blueprint its color is impregnated within the paper fibers. Unlike some of the more common printing methods, the image cannot be scratched or rubbed off. Prolonged exposure to UV light (i.e. direct sunlight) will result in a change of color or fading. If you decide to display your design drawings, do so that they will not be exposed to fluorescent lights or direct sunlight. Incandescent lighting is often used in areas where blueprints or paintings are to be displayed on a wall. If framing, use standard cheap-frames Plexiglas (plastic and Plexiglas block UV) and not glass to further reduce color shift. Lamination will also protect your blueprints from being faded or discolored. Thermal lamination is fine, as the blueprints handle heat well. You are receiving a "First Generation Blueprint", developed from our vault of vellum masters. The blueprint you are buying will come direct from this vellum -- a vellum that has been re-mastered and hand rendered, secondary referencing is avoided. That's our commitment to quality! Experience. Blueprinting is a trade. The right materials, machines and operators… Our Blueprinter is an expert and passionate about the work. Your blueprint will arrive with expanded borders and also crop marks. —complete with reference points and classification notes when applicable. You'll love the crisp, clean layout and the uniform high contrast between lines and background. —as a result, the blueprints become art; classically simple, yet stimulating enough too absorb. —replaced by more modern, less expensive printing methods, proper blueprints haven't been used for decades. "True Blue" Blueprinting is now mainly reserved for collectors.